Introducing the Anarchy Outdoors Precision Rifle Grip: "Penguin". 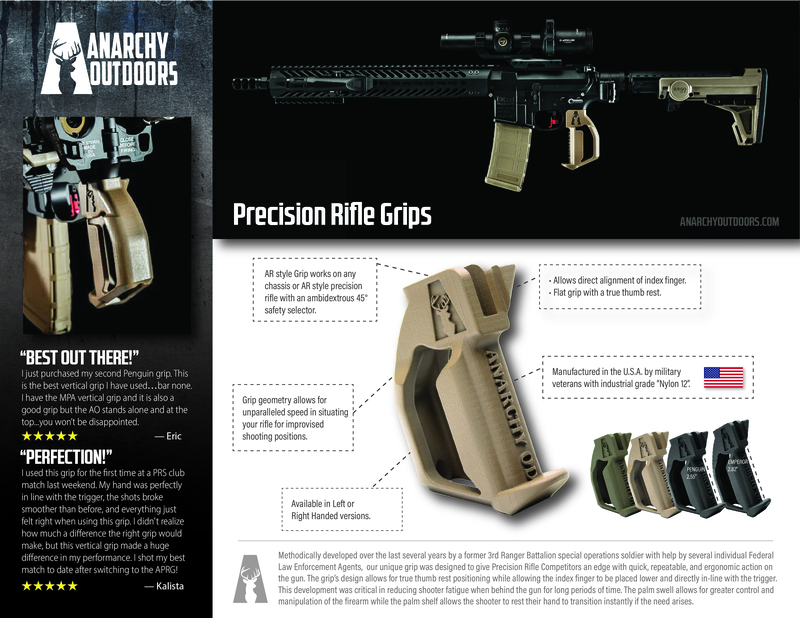 Methodically developed over the last several years by a former 3rd Ranger Battalion special operations soldier with help by several individual Federal Law Enforcement Agents, our unique grip was designed to give Precision Rifle Competitors an edge with quick, repeatable, and ergonomic action on the gun. The Penguin's design allows for true thumb rest positioning while allowing the index finger to be placed lower and directly in-line with the trigger. This development was critical in reducing shooter fatigue when behind the gun for long periods of time. The palm swell allows for greater control and manipulation of the firearm while the palm shelf allows the shooter to rest their hand to transition instantly if the need arises. The Penguin grip can be used on precision bolt action or precision AR Style rifles and is also available in a larger sized "Emperor" line. Dimensions: 2.6" x 1.5" x 4.25"
* Product designed & manufactured in Partnership with NECO Labs. I wanted a vertical grip for my Ruger Precision Rifle for PRS competitions. After doing some research, the "AO PRG" just kept popping up as a top recommendation. I thought it was kinda ugly but decided to give it a try anyways. Ultimately, I'm very happy with the purchase. The grip gives me the trigger finger placement I was looking for. Also, the look of it has really grown on me as I've used it more. I wish they would switch out the "Anarchy OD" lettering on the grip over to aggressive texturing and switch the thumb shelf from horizontal to a 45 degree angle, but those are more improvement opportunities than complaints. First of all I've got to say these guys are fantastic to work with. They get stuff out fast too. I gave this grip five stars even though I have to return it. I have really small hands and my hand slid right up it. My neighbor who has larger hands Held it and he just loves it. Like I said I gave it five stars just because these guys are so good to work with and this is really a cool grip.